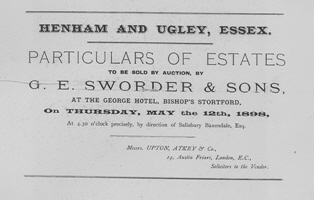 This sale was the most important auction of property in the village, typifying the break-up of so many estates in Britain at the end of the nineteenth century. 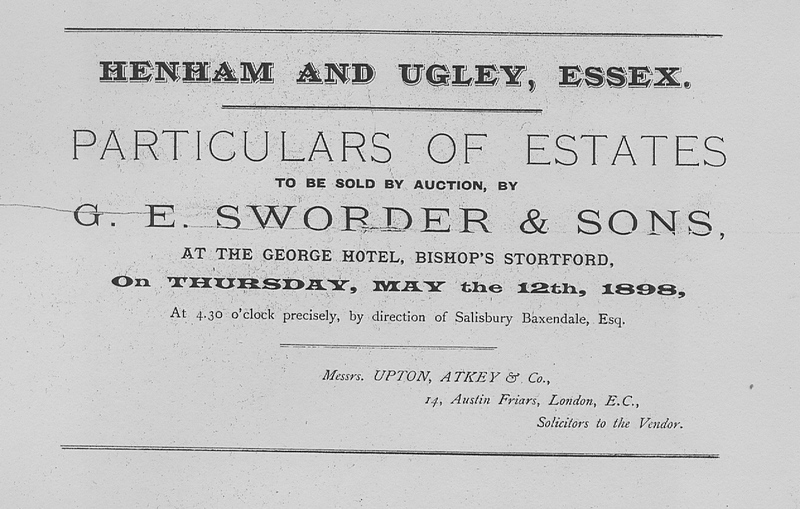 A copy of the auction catalogue can be seen at Essex Archive Office where it has the reference number SALE B5190. The sale catalogue shows a handwritten note ‘Mr Thomas Wright’ at the top. 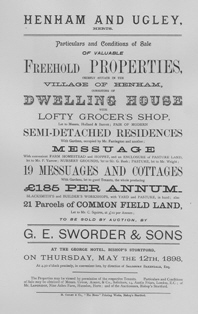 Dwelling House with a lofty grocers shop; a pair of semi-detached residences with gardens; a messuage with convenient farm homestead and hoppet, and an enclosure of pasture land; nursery grounds, pasture; 19 messuages and cottages with gardens, the whole producing £ 185 per annum; blacksmiths and builder's workshops, with yard and pasture, in hand; also 21 parcels of common field land let at £ 10 per annum. Immediately below is a plan of the auction Lots. The map also clearly shows the village ponds drawn as irregular shapes of concentric rings. Right, now it’s time to understand the sizes given for the plots of land of yesteryear as ‘acres’, ‘rods’, roods’ and ‘perches’. An acre is roughly 4046.873 square metres or 4,840 square yards and was the area that a medieval ploughman with a team of eight oxen was required to till in a day. There was some variation in this measurement across Britain. In England the acre was 4,840 square yards whilst in Scotland it was 6,150 square yards and in Ireland it rose to 7,840 square yards. The acre in medieval England was a furlong in length and a chain wide (a chain was twenty-two yards - cricketers will quickly recognise this figure ). The variations may have been due to the quality of the soil since some regions recognised the amount of land a man would need to feed his family for a year, which in some areas might be equivalent to 120 modern acres, but in others it might be only one quarter of this. A statute or Saxon acre is equal to a good-sized football pitch. The ploughman handled the plough while his boy controlled the oxen using a stick or 'rod', which had to be long enough to reach all the oxen (medieval ploughing was done with oxen, up to 4 pairs at a time). To reach his leading pair, the rod had to be sixteen and a half feet long or five and a half yards. This length enabled the ploughman to quickly calculate how much land had been ploughed of the width of the acre, such as 4 poles or rods to the chain. As a unit of area, a square perch (the perch being standardized to equal 16.5 feet) is equal to a square rood, 30+1⁄4 square yards (25.29 square metres) or 0.00625 acres. There are 40 square perches to a rood, 160 square perches to an acre. Unfortunately, sometimes a rod and a rood swapped meaning. The perch was used in the reign of Henry II (1154-1189), the pole since the 16C, and the rod since 1450. In the 16th century the lawful rod was decreed to be the combined length of the left feet of 16 men as they left church on a Sunday morning. No need to check this out. In our time, a square perch is roughly equivalent to the area marked out in a supermarket car park for two cars. OK, the maths lesson is over. To see the map below for the location of each Lot. Below is a detailed list of all the Lots in the auction together with the selling prices, the names of any occupants, and the names of most of the purchasers. 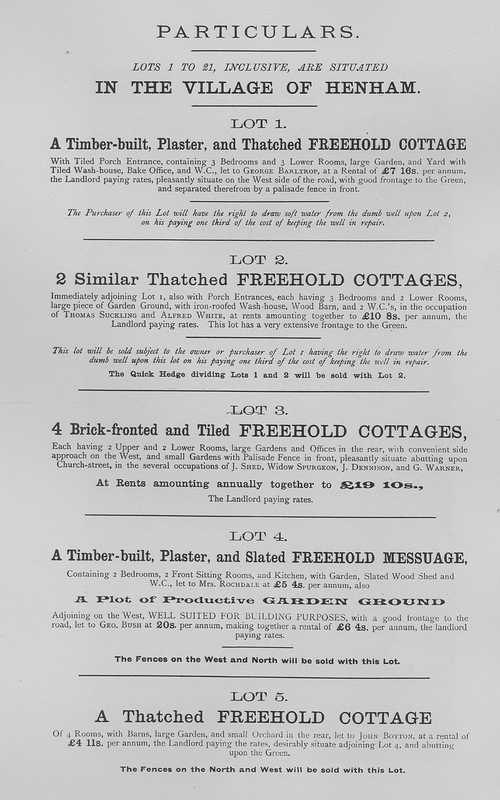 Lot 1 – a timber-built, plaster, and thatched freehold cottage with tiled porch entrance containing 3 bedrooms, 3 lower rooms, large garden, and yard with tiled wash house, bake office, and WC, let to George Barltrop, at a rental of £7 16s per annum, pleasantly situated on the west side of the road, with good frontage to the Green, and separated therefrom by a palisade fence in front. 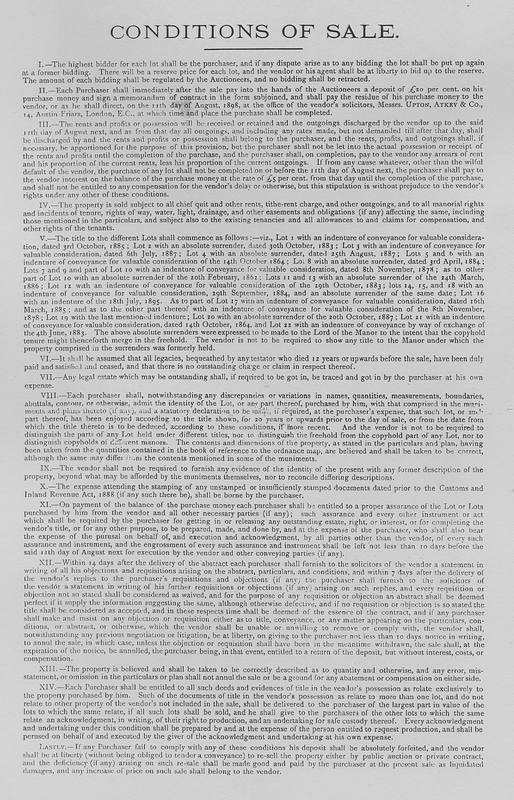 The purchaser will have the right to draw soft water from the dumb well upon Lot 2., on his paying one third of the cost of keeping the well in repair. Sold to H. Willett for £80 and presently known as ‘Cedar Cottage’ in Crow Street. The property, until recently the home of Miss Pimblett, has just been sold (2011). 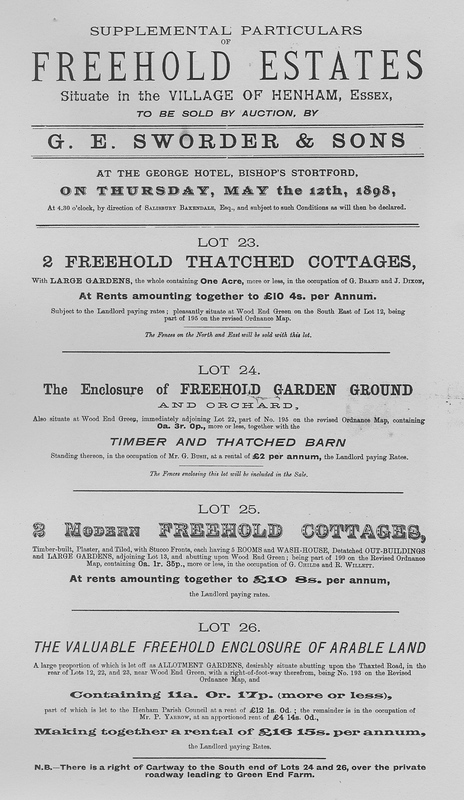 Lot 2 - 2 similar thatched freehold cottages immediately adjoining Lot 1, also with porch entrances, each having 3 bedrooms and 2 lower rooms, large piece of garden ground, with iron-roofed wash house, wood barn, and 2 WCs, in the occupation of Thomas Suckling and Alfred White, at rents amounting together to £10 8s per annum, this Lot has a very extensive frontage to the green. This Lot will be sold subject to the owner or purchaser of Lot 1 having the right to draw water from the dumb well upon this Lot on his paying one third of the cost of keeping the well in repair. The quick hedge dividing Lots 1 and 2 will be sold with Lot 2. Sold to W. Wright for Ancient Order of Shepherds (known hereafter as ‘Shepherds’-RG) for £120 and presently known as ‘Suckling Cottage’ in Crow Street and next door to ‘Cedar Cottage’. Lot 3 - 4 brick-fronted and tiled freehold cottages, each having 2 upper and 2 lower rooms, large gardens and offices in the rear, with convenient side approach on the west, and small gardens with palisade fence in front, pleasantly situate abutting upon Church Street, in the several occupations of J. Shed, Widow Spurgeon, J. Dennison, and G. Warner, at rents amounting annually to £19 10s. Sold to W. Wright for Ancient Order of Shepherds for £120. Now occupied, in west - to - east order, by Pat Russell, Bessie Haydon, and the Lafferty family occupying 2 merged homes. 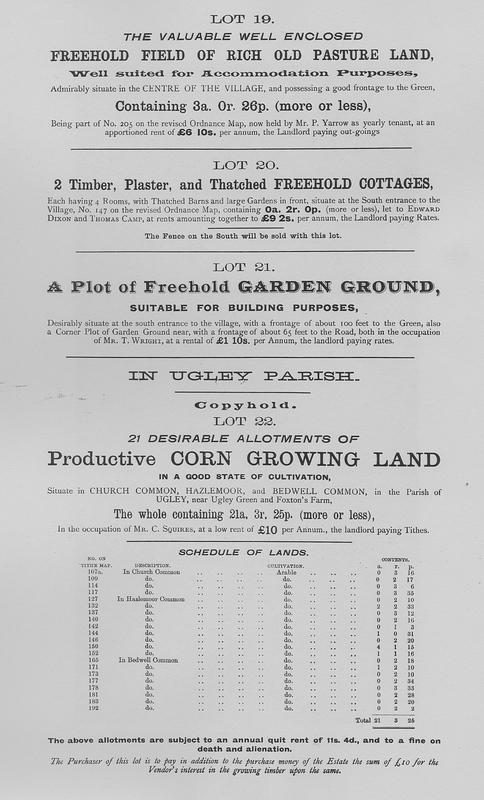 Lot 4 – a timber –built, plaster, and slated freehold messuage, containing 2 bedrooms, 2 front sitting rooms, and kitchen, with garden, slated wood shed and WC, let to Mrs Rochdale at £5 4s per annum, also a plot of productive garden ground adjoining on the west, well suited for building purposes, with a good frontage to the road, let to George Bush at 20s per annum, making together a rental of £6 4s per annum. The fences on the west and north will be sold with this Lot. Sold to G. Hornsby for £105. Now known as ‘Beech Cottage’. Lot 5 – a thatched freehold cottage of 4 rooms, with barns, large garden, and small orchard in the rear, let to John Boyton, at a rental of £4 11s per annum, desirably situate adjoining Lot 4, and abutting upon the Green. The fences on the west and north will be sold with this Lot. Sold to G. Hornsby for £58. Now known as ‘Lamberts’. Lot 6 - a timber–built and thatched freehold messuage, 4 bedrooms, 2 sitting rooms, kitchen, dairy, wood shed, WC etc with convenient yard in the rear, with homestead, consisting of cow house, fowl house, stable, loose box, and piggery; garden at side, with well of water, and capital hoppet adjoining, held by Mr P Yarrow, with other lands. The rent of this Lot has been apportioned at £ 10 per annum. The fence on the north side will be sold with this Lot. Sold to Mr P. Yarrow for £125. Now known as ‘Ash House’. Lot 7 - a valuable enclosure of old pasture land containing 0a. 3r. 9p, more or less, now held by Mr. R. Wright. The rent of this Lot has been apportioned at £ 2 per annum. The fence on the north side will be sold with this Lot. This plot was sold for £40 to Hare (?) and is now known, in 2011, as Wright’s Piece. This Lot has since been developed into a small row of modern homes. Lot 8 - a pair of well-built modern timber and tiles freehold dwelling houses, facing south, each having 3 bedrooms, 2 sitting rooms, kitchen, front porch entrance, brick and tiled larder, wash-house and WC, gardens, and palisade fence in front and good gardens in the rear, one of which is a tiled and timbered wood shed, and the other a wood shed, tool shed, and a stable, with loft over, in the respective occupations of Mrs. Hickley and Mr. F. M. Farrington. Shown as no. 212 on the Ordnance Survey. Sold for £250 to Hare (?). Now known as ‘Green View Cottage’. Lot 9 – a valuable freehold enclosure of old pasture land, with a good frontage to the road, wee adapted for building or other accommodation purposes, together with the lofty-tiled blacksmith's shop, pent-house, and cart-shed, no. 213 on the revised Ordnance Map, comprising in the whole 1a. 3r. 31p. 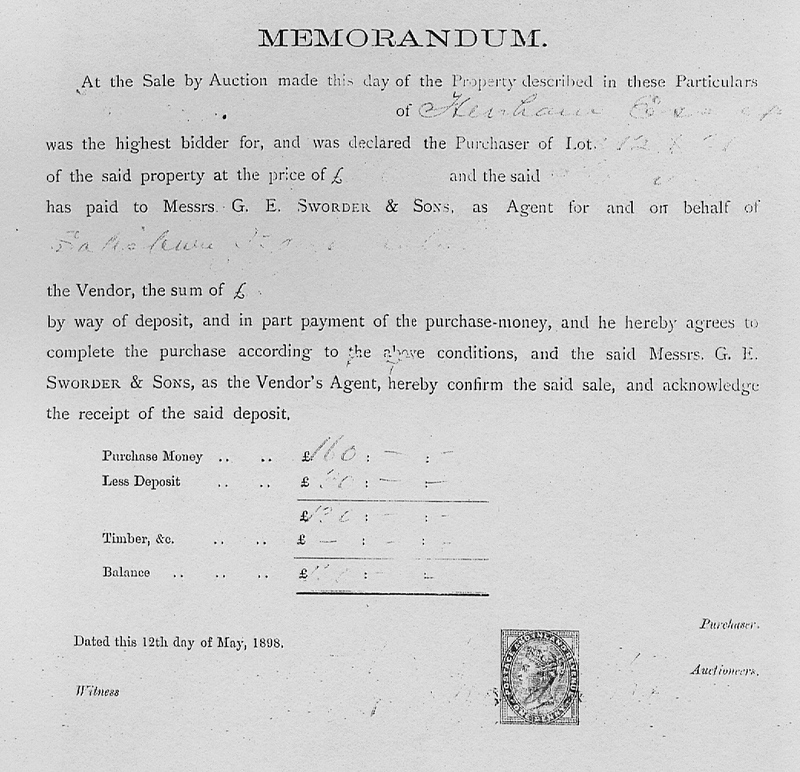 (more or less), in the occupation of Mr. F. M. Farrington, at a low rental of £4 12s. per annum, the Landlord paying outgoings. A right-of-cartway over this Lot, as shewn by a dotted line on Plan, is reserved to the owner of the adjoining property on the north. Sold for £80 to R W Newport. Now the site of 'Dragon Halt'. Lot 10 – a substantial range of modern buildings with iron roof, consisting of large carpenter's shop, counting house, chaise house, cart shed, stable, large store shed, a d saw pit shed, recently used as the estate workshops, together with the yard and pasture ground adjoining No. 214 on the revised Ordnance Map, containing in the whole 0a. 3r. 2p (more or less) with a good frontage to the Green. This Lot is in hand, and immediate possession can be had if required. The fences on the north and west will be sold with this lot. Sold for £75-80 to Hornsby. Now the site of 'Windamere'. Lot 11 – a corner property, with a double frontage to the Green, consisting of a freehold tiled cottage of 4 rooms, with garden, shed, and WC, let to William Dennison, at a low rent of £3 5s per annum, the landlord paying rates. There is a well of water with pump upon this Lot. The fences enclosing this Lot will be included in the Sale. Now known as ‘Pleasant Cottage’. Sold for £40 to G. Reed. 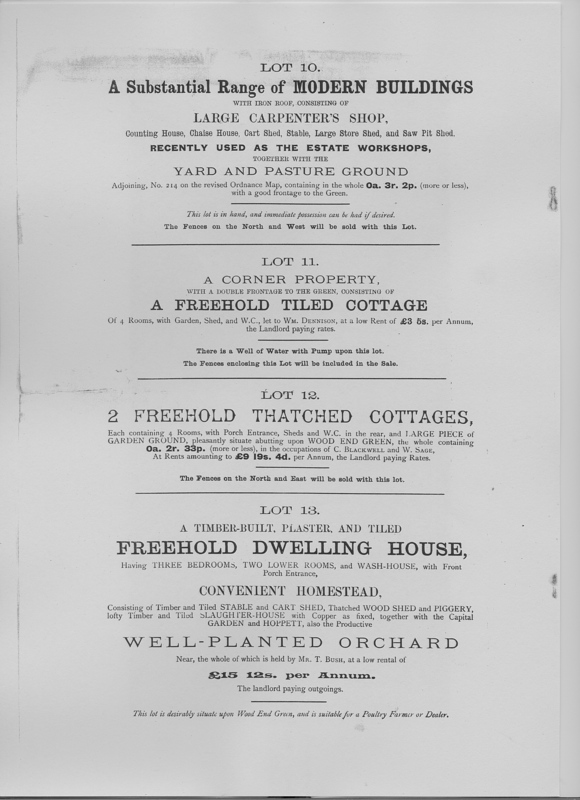 Lot 13 – a timber-built, plaster, and tiled freehold dwelling house, having 3 bedrooms, 2 lower rooms, and wash-house, with front porch entrance, convenient homestead consisting of timber and tiled stable and cart shed, thatched wood shed and piggery, lofty timber and tiled slaughter-house, with copperas fixed, together with the Capital garden and hoppett, also the productive well-planted orchard near, the whole of which is held by Mr. T. Bush, at a low rental of £15 12s per annum, the landlord paying outgoings. 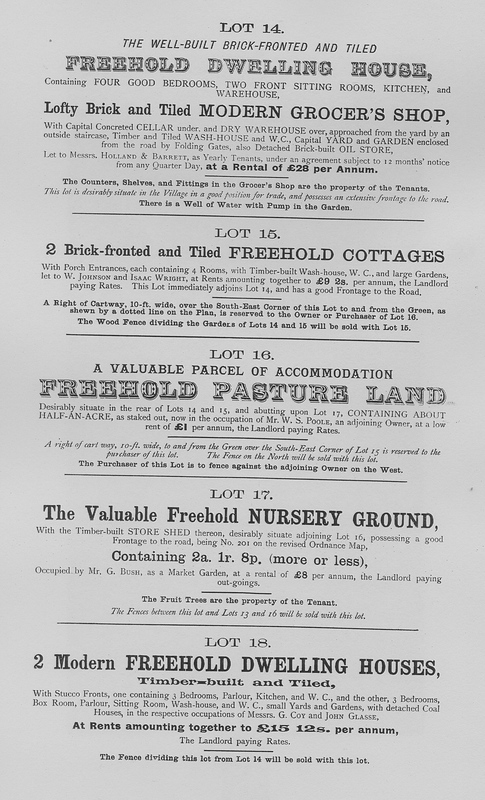 This Lot is desirably situate upon Wood End Green, and a suitable for a poultry farmer or dealer. Sold for £230 to Sir W. Gilbey. Lot 15 – 2 brick-fronted and tiled freehold cottages with porch entrances, each containing 4 rooms, with timber-built wash-house , WC, and large gardens, let to W. Johnson and Isaac Wright, at rents amounting together to £9 2s. per annum, the landlord paying rates. This Lot immediately adjoins Lot 14, and had a good frontage to the road. A right of cart-way, 10 foot wide, over the south-east corner of this Lot to and from the Green, as shewn by a dotted line on the Plan, is reserved to the owner or Purchaser of Lot 16. The wood fence dividing the gardens of Lots 14 and 15 will be sold with Lot 15. Sold for £120 to Shepherds. Now known as ‘Snow Cottage’ and ‘Coopers Cottage’. 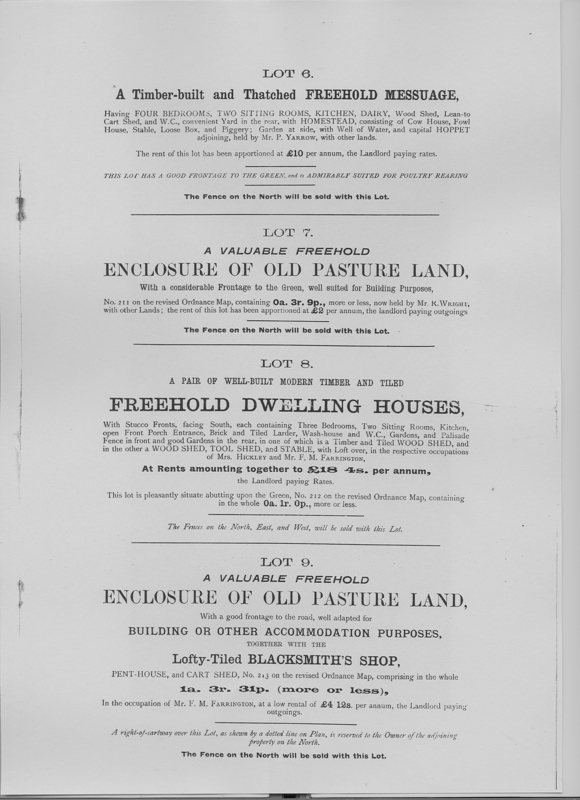 Lot 16 – a valuable parcel of accommodation , freehold pasture land, desirably situate in the rear of Lots 14 and 15, and abutting upon Lot 17, containing about half-an-acre, as staked out, now in the occupation of Mr. W.S. Poole, an adjoining owner, at a low rent of £1 per annum, the landlord paying rates. A right of cart way, 10 feet wide, to and from the Green over the south-east corner of Lot 15 is reserved to the purchaser of this Lot. The fence on the north side will be sold with this Lot. 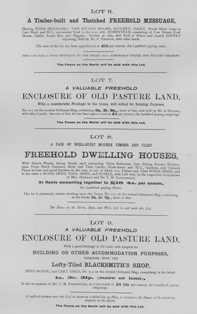 The purchaser of this Lot is to fence against the adjoining owner on the west. Sold for £20 to Holland & Barrett. It was a plot of land behind ‘Snow Cottage and ‘Coopers Cottage’ and now known as “Barley House”. 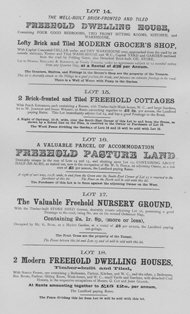 Lot 17 - the valuable freehold nursery ground with the timber-built store shed thereon, desirably situate adjoining Lot 16, possessing a good frontage to the road, being No. 201 on the revised ordnance Map. Containing 2a. 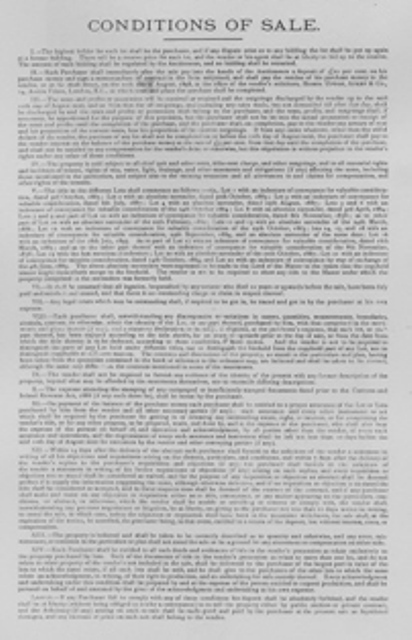 1r.8p. (more or less), occupied by Mr. G. Bush as a market garden, at a rental of £8 per annum, the Landlord paying out-goings. The fruit trees are the property of the tenant. The fences between this Lot and Lots 13 and 16 will be sold with this Lot. Sold for £110 to Hare (?). Now occupied by modern homes known as ‘Medlars Walk’, ‘Whitecroft’ and ‘Spinneys’. 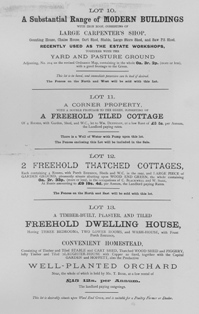 Lot 18 - 2 modern freehold dwelling houses, timber-built and tiled, with stucco fronts, one containing 3 bedrooms, parlour, kitchen, and WC, small yards and gardens, with detached coal houses, in the respective occupations of Messrs. G. Coy and John Glasse, at rents amounting together to £15 12s. perannum, the Landlord paying Rates. The fence dividing this Lot from Lot 14 will be sold with this Lot. Sold for £175 to Shepherds. Now known as ‘Viola Cottage’ and ‘White Pine’. Lot 19 - valuable well-enclosed freehold field of rich old pasture land, well-suited for accommodation purposes, admirably situate in the centre of the village, and possessing a good frontage to the Green, containing 3a. 0r. 26p (more or less), being part of No. 205 on the revised Ordnance Map, now held by Mr. P Yarrow as yearly tenant, at an apportioned rent of £6 10s per annum, the Landlord paying outgoings. Sold for £120 to ‘Wigan’ (?). Now known as Hall Close and containing a number of larger detached homes. Lot 21 - a plot of freehold garden ground, suitable for building purposes, desirably situate at the south entrance to the village, with a frontage of about 100 feet to the Green, also a corner plot of garden ground near, with a frontage of about 65 feet to the road, both in the occupation of Mr. T. Wright, at a rental of £1 10s. per annum, the landlord paying rates. Sold for £30 to Mr. T. Wright. Now known as ‘Coopers Hall Cottage’ and ‘Heathfield’. 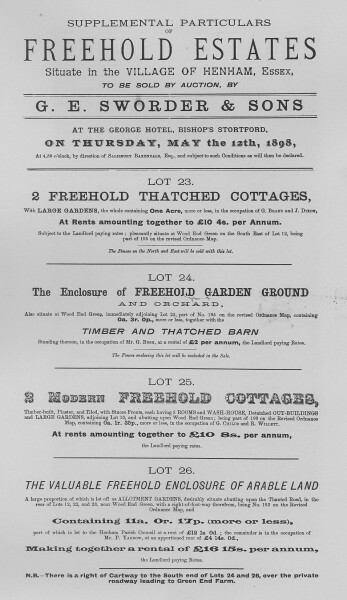 Lot 23 - two freehold thatched cottages, in large gardens, the whole containing one acre, more or less, in the occupation of G. Brand and J. Dixon, at rents amounting together to £10 4s per annum, subject to the Landlord paying rates, pleasantly situate at Wood End Green on the south-east of Lot 12, being part of 195 on the revised Ordnance Map. The fences on the north and east will be sold with this Lot. 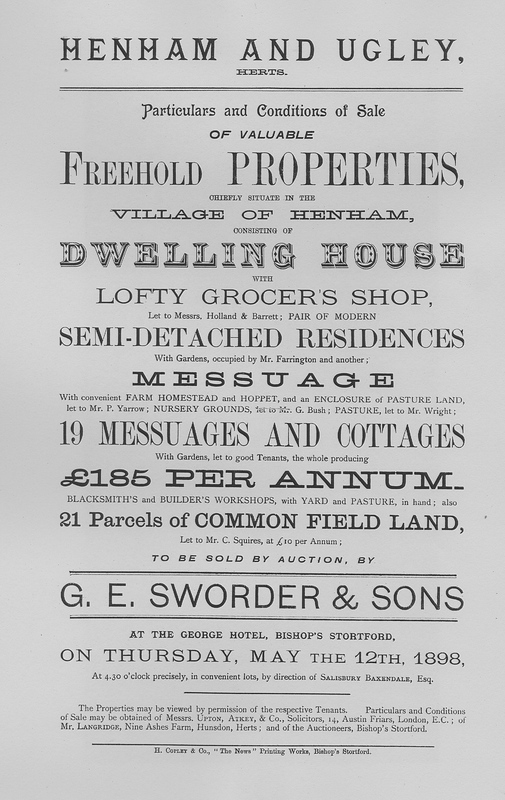 Lot 24 - the enclosure of freehold garden ground and orchard, also situate at Wood End Green, immediately adjoining Lot 22 (BUT MUST MEAN LOT 23) part of No. 195 on the revised Ordnance Map, containing 0a 3r. 0p, more or less, together with the timber and thatched barn standing thereon, in the occupation of Mr. G. Bush, at a rental of £2 per annum, the Landlord paying rates. The fences enclosing this Lot will be included in the sale. 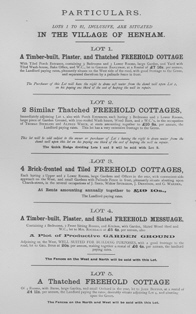 Lot 25 - two modern freehold cottages, timber-built, plaster, and tiled, with stucco fronts, each having 5 rooms, and wash house, detatched outbuildings and large gardens, adjoining Lot 13, and abutting upon Wood End Green; being part of 199 on the Revised Ordnance Map, containing 0a 1r. 35p, more or less, in the occupation of G. Childs and R. Willett. at rents amounting together to £10 8s per annum, the Landlord paying rates. Lot 26 - the valuable freehold enclosure of arable land. 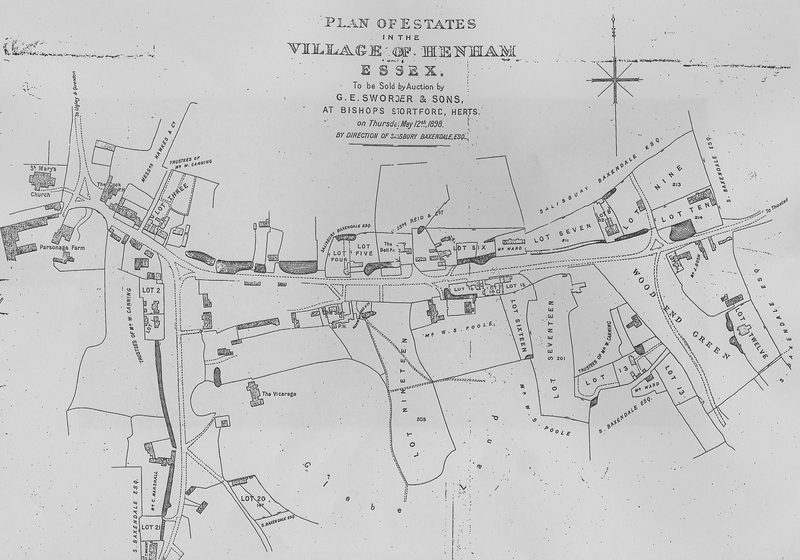 A large proportion of which is let off as allotment gardens, desirably situate abutting upon the Thaxted Road, in the rear of Lots 12,22, and 23 near Wood End Green, with a right-of-way therefrom, being 193 on the Revised Ordnance Map, and containing 11a. 0r. 17p. (more or less), part of which is let to Henham Parish Council at a rent of £12. 1s 0d. 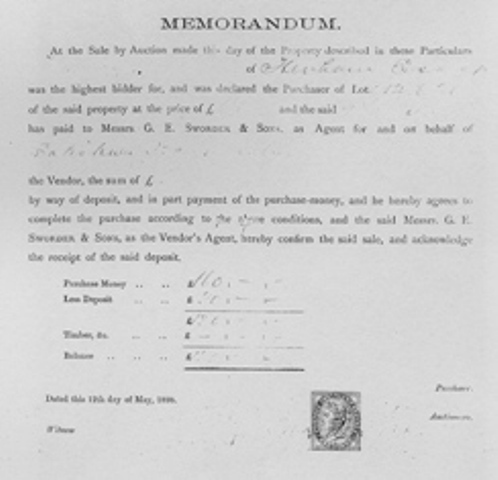 ; the remainder is in the occupation of Mr. P. Yarrow, at an apportioned rent of £4 14s. 0d., making together a rental of £16 15s per annum, the Landlord paying rates. There is a right-of-cartway to the south end of Lots 24 and 26 over the private roadway leading to Greeen End Farm.